The National Board of Certification for Medical Interpreters is celebrating its 10th Anniversary!! Congratulations to all our CMIs for being part of this great organization! The National Board was the first organization that offered certification for medical interpreters nationwide. We are the pioneers in the industry and continue to be a leading organization for certification. Our first certification was our Spanish program, and thanks to a generous grant from the State of Oregon we were able to expand our program to five more languages (Korean, Mandarin, Cantonese, Vietnamese and Russian). Yes, that's right, we offer FULL medical interpreter certification in SIX languages. What this means is that we offer a CMI credential in all languages. Why is that so important? As interpreters we work in two languages, our source and our target. Therefore, it stands to reason that we should be tested on both. The definition of a "qualified interpreter" is someone whose language proficiency, interpreting skills and medical knowledge is tested in BOTH their working languages. We meet the standards and definition of the Joint Commission and the ACA Section 1557. When we added Proctor U, the at-home online testing, that gave us the ability to test from anywhere in the world via technology, and our certification went international. We have certified interpreters in various countries. What's in the horizon for the National Board? Our organization is currently looking into adding a new credential that would expand to over 50 languages. This new credential would not be a certification, but rather a "Qualification". Nonetheless, by you being tested in your source and target languages, it will prove your competency in BOTH. As any organization we've had our ups and downs, but rest assured that our credential is still TOPS in the field and will continue its path. Our exams are known for being rigorous (as any good certification exam should be). When you pass our exam, you know that your skills, proficiency and medical terminology knowledge meet the high standards we have set. You can be proud of your achievement! The industry is changing, stakeholders are becoming more aware of the difference between a "Certified Interpreter" and a non-certified one. They understand the quality and professionalism a certified interpreter brings to the encounter. The provider and the LEP understand that patient safety is at stake, and that they can trust and rely on the certified interpreter for good, clear, and precise communication. According to the Bureau of Labor Statistics "employment of interpreters and translators is projected to grow 18 percent from 2016 to 2026, much faster than the average for all occupations. Globalization and large increases in the number of non-English-speaking people in the United States will drive employment growth. Job prospects should be best for those who have professional certification". This is great news!! If you haven't already gone for your certification, what are you waiting for? 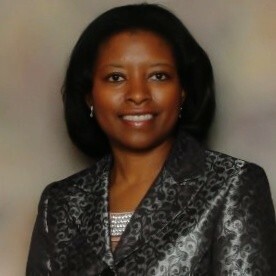 Go visit our website at www.certifiedmedicalinterpreters.org. If you are already among our elite group of CMIs, congratulations and remember, it doesn't stop once you've passed the test, you must continue to learn, grow and develop your skills. Our mission is not over yet, there is much work still to be done to continue growing the profession. We must ALL UNITE to bring forth the profession and the industry, keeping in mind the main goals – Certification and Patient Safety! Let's celebrate with pride these 10 years, and let's celebrate for what the future holds! 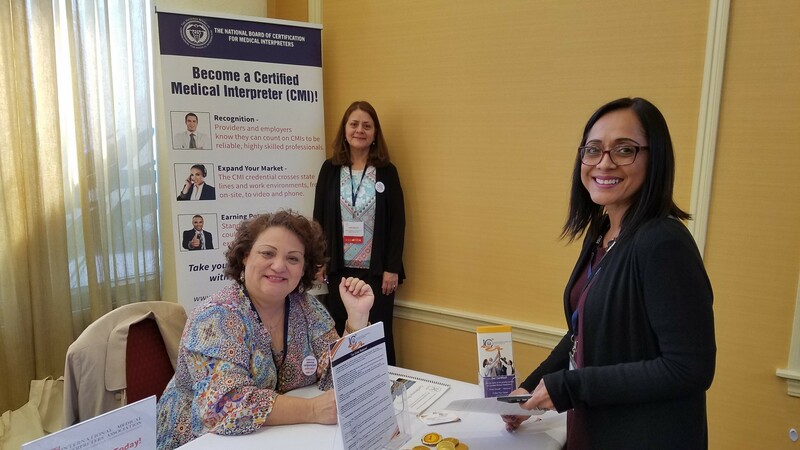 The IMIA (International Medical Interpreters Association) is the organization that reviews and approves CEUs for NBCMI (National Board of Certification for Medical Interpreters). Once they receive an application from an institution, conference or event, they begin the review process to ensure that the workshop meets the educational requirements to be awarded a CEU. Without an application, the IMIA cannot approve CEUs, so always make sure that the institution, conference and event you are attending has applied for them. The IMIA recently made changes to their CEU process and REDUCED their fees for conferences/events and institutions applying. Check out this link to read more. In fact, feel free to share this information with those organizations you seek CEUs from. In January of 2018, NBCMI no longer automatically accepted CEUs from other organizations such as ATA, RID or CCHI. The reason this change was made was to ensure that our high standards were met. We wanted our CMIs to ONLY take workshops related to medical, as this is a medical certification. Other organizations approve CEUs for workshops that are not related to medical. Q: What is the benefit of Continuing Education? Healthcare, medicine, and nursing are constantly changing; we are experiencing a new wave of innovation, game-changing new technologies and treatments, transforming the practice of medicine, dramatically altering the patient experience, and creating conditions for even more breakthroughs. With all these happenings we as professional medical interpreters need to recognize that continuing education is the ride we must take to keep growing and evolving accordingly. 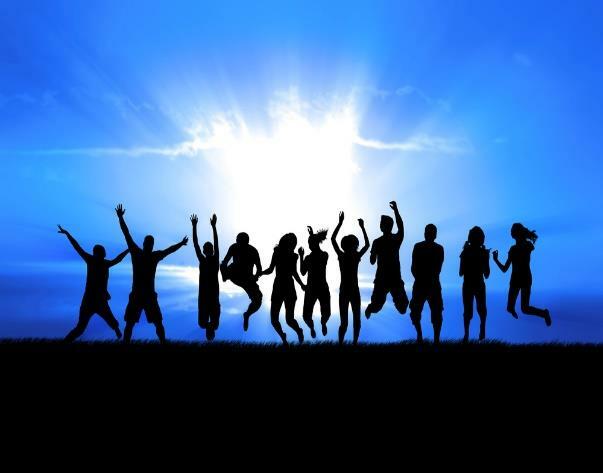 Overcome the notion that we must be regular…it robs you of the chance to be extraordinary. Valid National Credential – Our certification exams are validated by a third-party organization (PSI), delivering psychometric quality, statistical analysis and professionally sound test form assembly. The CMI certification continues to be a very VALID and highly recognized credential for its standards and excellence. Written exam focuses 61% on medical knowledge, 15% on code of ethics, and the remaining 24% focuses on roles of the interpreter, cultural awareness and legislation and regulations. Oral exam focuses 35% on medical terminology within the context in two languages, 30% on mastery of linguistic knowledge in English and target language, 25% on consecutive interpreting and sight translation from English to the target language and 10% on cultural awareness. Exams can be scheduled YEAR ROUND at a mutually agreed upon time at one of our many testing centers. We offer the convenience of testing from home through its Proctor U online proctoring, using a cutting-edge methodology for certification programs. FULL Certification in More Languages – The National Board offers FULL certification in six (6) languages: Spanish, Mandarin, Cantonese, Russian, Vietnamese, and Korean. What this means is that all of our six languages are fully tested in written and oral, not only in English, but also in the interpreter's target language. This meets the definition of a qualified interpreter by the Joint Commission, as well as by the Affordable Care Act Section 1557. Five-Year Recertification – Our certification is valid for five years making it more cost effective. Credential Maintenance – Requires 30 hours of continuing education units, which can be done within the five-year span. Continuing education MUST focus on medical interpreting and medical knowledge courses, maintaining the high standards for the credential. Online Registry - The NBCMI registry is public. Prospective employers can search our registry and contact our interpreters directly by email. What a great way to boost your visibility and improve job opportunities. It also allows prospective employers to verify credentials. International Recognition - The CMI credential is internationally recognized. Pioneers in the Industry – The National Board was founded in 2009 and was the FIRST to offer certification for medical interpreters nationwide, setting the testing standards. IMIA – The National Board is proud to be an independent division of the International Medical Interpreters Association (IMIA). The IMIA was founded in 1986 and in 1987 published the first Code of Ethics for medical interpreters. Come Join our Growing Family of CMIs! Ten Years of Certification: Now what? By Izabel E. T. de V. Souza, M.Ed., CMI-Spanish, Ph.D. It is hard to believe that medical interpreters have had national certification for the past 10 years. 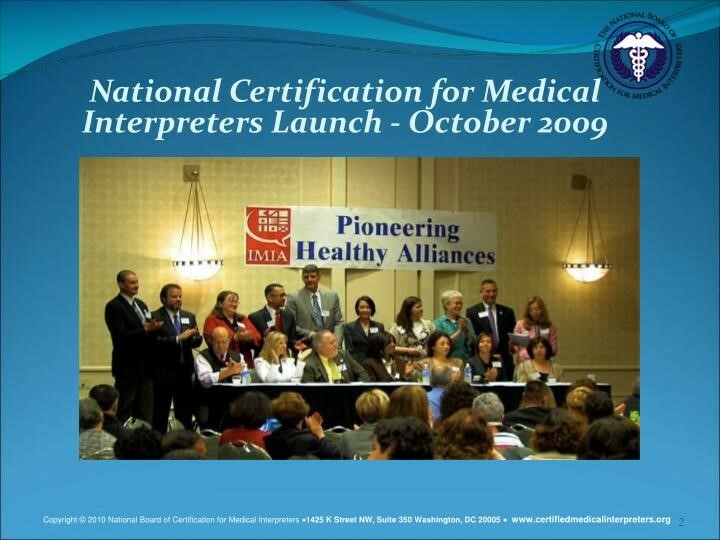 When the first national certification for medical interpreters was launched at the IMIA Conference, on October 9th, 2009, in front of 500 attendees, we had no idea what would come ahead. Yet knew that we were making the right decision to move forward. What has happened since certification became a reality? An important development was the expansion of certification testing languages: National Board added Vietnamese, Korean, Cantonese, Mandarin, and Russian. Also, the National Board added proctored online testing, for both written and oral exams, as an optional format of testing, while maintaining it's on demand anytime testing at third-party testing centers. So now what? A ten-year anniversary seems like a good point in time to reflect on where to go next. 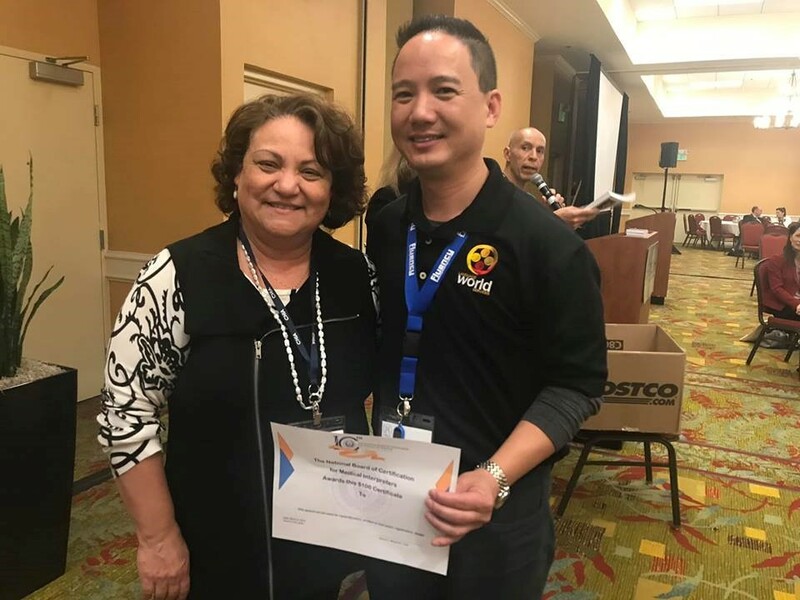 Congratulations to Kenneth Nyugen for winning a $100 Voucher from NBCMI at the CHIA Conference 3/10/19. Hopefully soon a Certified Medical Vietnamese Interpreter. 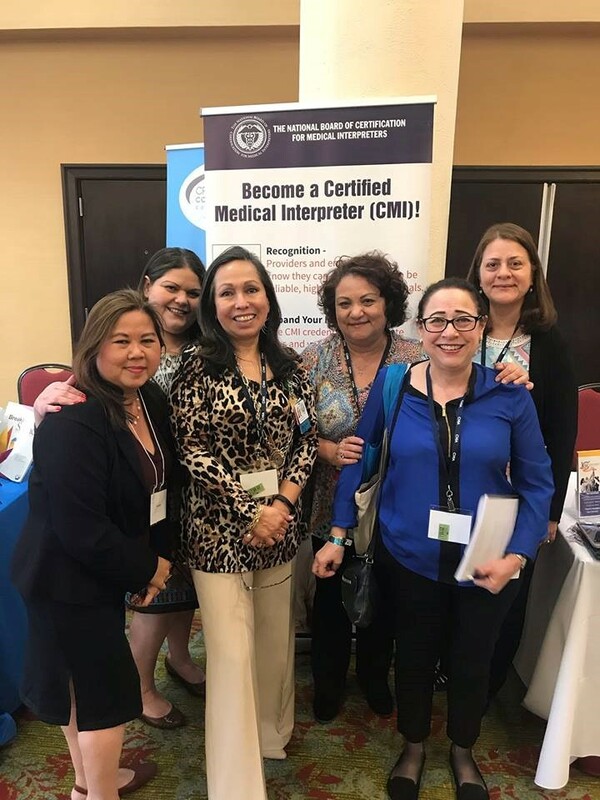 The photo shown above shows the slogan we chose 10 years ago to finally accomplish a dream – to offer national medical interpreter certification. It was high time! Interpreters had long sought to be part of a bona fide profession and to stand together with other health care providers as equal partners working for the benefit of the patient. This dream started in 1986 with the founding of the MMIA (Massachusetts, and then the International Medical Interpreters Association), which had in its Bylaws the responsibility to work towards creating a fair and authentic certification tool for medical interpreters. Through a long process of vision, leadership, allocating resources and the volunteer work of many, many interpreters, we took the bold steps necessary to realize our dream. The year was 2007. . .
Izabel Arocha then President of the IMIA contacted me and asked if I would join her on a task force to bring about certification efforts. I jumped at the chance to assist her in these endeavors, as that was the reason why I founded MiTio - To advance the education and certification credentials of bilingual individuals in Hospitals and Clinics across America. When I first started on the workgroup, it had been ongoing for about a year prior to my arrival, and we were meeting weekly to discuss test questions and certification initiatives in general. This went on for about another six months and then things got interesting. Workgroup transforms into Certification Task Force. CORRECTION NOTE: It has come to the attention of the NBCMI that in our past issue the name of the H. Lee Moffitt Cancer Center was misspelled "Moffit". We regret the mistake made and apologize for the inconvenience this may have caused.